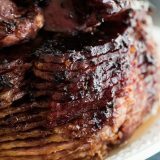 This Sweet and Spicy Ham Glaze Recipe is so easy with only 3 ingredients – jam, chipotle peppers and of course, the ham! You’ll love this easy baked ham recipe that’s a little bit sweet and a little bit spicy. Place the ham in a shallow baking dish or roasting pan, fatty side up. (Your ham will most likely be a half ham, so you will place the ham cut side down.). Cover the dish tightly with aluminum foil and place in the oven to bake. Set a timer for 15-18 minutes per each pound. 45 minutes before the ham is done, combine the jam and the chipotles in adobo in a small dish. Remove the ham from the oven and uncover. With a sharp knife, score the top of the ham in a diamond pattern. Brush the glaze mixture over the top and sides of the ham. Return the ham to the oven and continue to bake for 45 minutes, or until an internal temperature of 145ºF is reached, basting the ham once or twice.